In the last blog Karen Greenhaus commented: "Thanks for mentioning the Sketchpad Explorer for the iPad! There are a lot of folks from Key Curriculum and KCP Tech doing presentations (Nick Jackiw, Scott Steketee, Daniel Scher, Bill Finzer, Cliff Konold, myself) with Sketchpad, TinkerPlots and Fathom. As always, focused on dynamic mathematics and using technology appropriately to engage students in learning math." Nick Jackiw, Key Curriculum Press Technologies, Inc.
Cliff Konold, University of Massachusetts Amherst. Daniel Scher, Key Curriculum Press Technologies, Inc.
CLIME is working on a dynamic list of the technology sessions that you can update by contacting the CLIME office. It will updated almost immediately! Karen also points out that (in addition to the BuzzHub, and our CLIME Booth in the exhibit hall): "...Key will be doing a lot [in their booth], so [I] just wanted to pass that along so folks can come by and play with math and technology...we will have iPads and computers to explore." Sounds good. The exhibit hall will be a good place to discover vendors who are promoting this dynamic vision of exploration tools. I'll spotlight some of them in the next issue of this CLIME Connections blog. 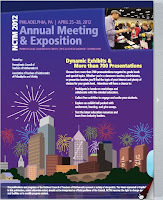 For more details on the conference, check out NCTM's cool Online Preview flipbook.